An in-vitro and in-vivo study published in the Journal of Investigative Dermatology in February 2015 found that treatment with delta-9-tetrahydrocannabinol (THC) and cannabidiol (CBD) helped to decrease the viability of melanoma cells. Cells perform autophagy, a process designed to clean out intracellular debris (e.g. old cell parts [organelles], proteins that are no longer needed, etc.) with the help of lysosomes (organelles that contain enzymes that help to break down proteins, fats, sugars, DNA and RNA building blocks, etc.). Previously collected evidence has shown that in the first phases of cancer development, autophagy is useful in helping to prevent cancerous growth. However, in later stages, autophagy may actually contribute to the formation of cancer by providing resources to cancer cells that help in maintaining survival. In this study, researchers explored whether or not cannabinoids could induce apoptosis (i.e. programmed cell death), and what role autophagy played in this induction, in melanoma cells. THC leads to creation of a fat called sphingolipid ceramide. Sphingolipid ceramide leads to (1) stress on the endoplasmic reticulum (ER; the smooth ER is a part of the cell involved in lipid and carbohydrate metabolism, as well as detoxification, and the rough ER is a part of the cell involved in protein synthesis) and (2) prevention of the Akt/mTORC1 signaling pathways (which prevent apoptosis by inhibiting autophagy, and lead to increased protein production, helping to keep cells alive and functioning properly) through activation of the protein TRIB3. This stress and prevention of pathways leading to increased cell survival may lead to increased death of melanoma cells. The researchers note, “when lower doses of THC are combined with CBD the anti-tumour effect was enhanced in vitro”. While the use of THC alone helped to decrease melanoma cell survival, use of a caspase inhibitor (i.e. an agent that prevents activation of enzymes that induce apoptosis) helped to increase melanoma cell death even further. Importantly, while THC helped to increase cell death in melanoma cells in a dose-dependent manner (i.e. the higher the concentration used, the more cell death that occurred), there was no increase in cell death in normal melanocytes (up to a THC concentration of 6 µM, which is beyond the concentration needed to induce cancer cell death). 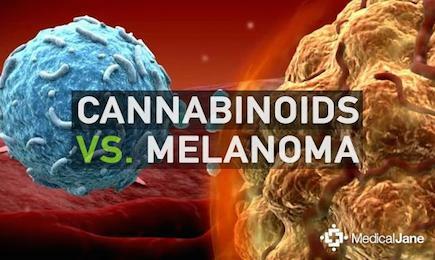 Therefore, THC treatment destroyed abnormal/cancerous melanocytes, but, importantly, did not destroy normal cells. These results add to a growing body of evidence that suggests that cannabinoids may be useful for the treatment of various types of cancer (breast, prostate, lung, skin, pancreatic, brain, bladder cancer, leukemia). Specifically, they demonstrate that the use of phytocannabinoids may be useful in the treatment of both BRAF-mutated and BRAF-wildtype (i.e. “normal” BRAF) melanoma. This is especially important for patients with BRAF-wildtype melanoma, given the limited treatment options for this form. In contrast to alkylating agents used in chemotherapy treatment, phytocannabinoids have so far shown to have a highly favorable safety profile, which provides an additional rationale for increasing research on whether or not cannabinoid therapies are effective for the treatment of cancer, including melanoma.